Imaged while on holiday at the friendly astronomy guesthouse 'Caño Chico' in Villanueva del Conde, Spain. I used the local SkyViewPro mount with an improvised fitting for the Nikon D7000. Thanks to the absence of light pollution I could shoot 300sec raw images without filter. The sky over there is really good, the picture doesn't do it justice. 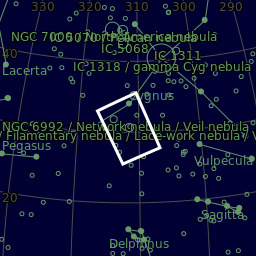 I saw more of the Veil nebula in the owner's 500mm Dobsonian than is visible on the photo!